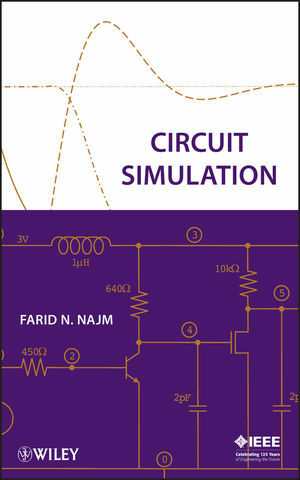 With problem sets and computer projects at the end of every chapter, Circuit Simulation is ideally suited for a graduate course on this topic. It is also a practical reference for design engineers and computer-aided design practitioners, as well as researchers and developers in both industry and academia. FARID N. NAJM is a Professor in the Department of Electrical and Computer Engineering (ECE) at the University of Toronto. He received a BE degree in electrical engineering from the American University of Beirut (AUB) in 1983 and a PhD degree in ECE from the University of Illinois at Urbana-Champaign (UIUC) in 1989. He then worked with Texas Instruments before joining the ECE Department at UIUC as assistant professor, later becoming associate professor. Dr. Najm joined the ECE Department at the University of Toronto in 1999, where he is currently Professor and Chair. His expertise is in the area of computer-aided design for integrated circuits, with an emphasis on circuit-level issues related to power, timing, variability, and reliability. Dr. Najm is a Fellow of the IEEE.